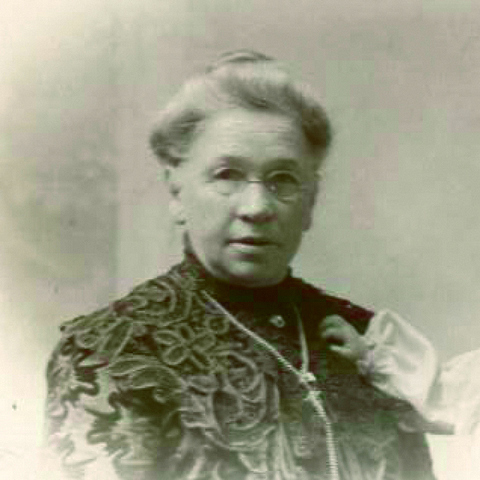 Long before there was an International Women’s Day, there was Caroline (Rhomberg) Fischer, a savvy, spirited entrepreneur from Dubuque. After her husband died in 1875, the 31-year old widow and mother of five literally took the reins of her late husband’s ice delivery business—and you won’t believe what she did next. You get a taste of Caroline’s remarkable story when you dine at Caroline’s Restaurant (named in her honor) in the historic Hotel Julien Dubuque. As you savor your banana bread French toast (yes, I recommend it! 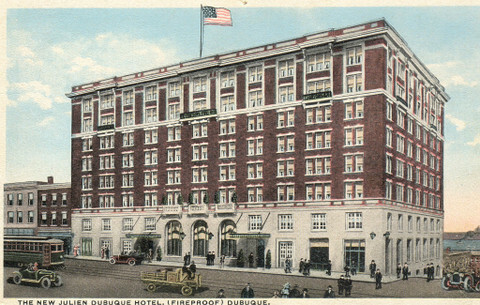 ), it’s amazing to think a hotel or inn has occupied the present site of Hotel Julien Dubuque (at the corner of Second and Main Street) since 1839. Caroline became part of the hotel’s storied history in the late 1800s. While Victorian-era ideals dictated that a woman’s place was in the home, sheer necessity—and a healthy dose of moxie—ensured that Caroline would break the mold. In the days before electric freezers and electric refrigeration, Caroline’s husband, Louis, was a partner in the Fischer ice business. After Louis contracted pneumonia and died in 1875 after falling into the Mississippi River while cutting ice, Caroline took over his ice business. The 31-year-old widow with five young children also took control of her family’s destiny. 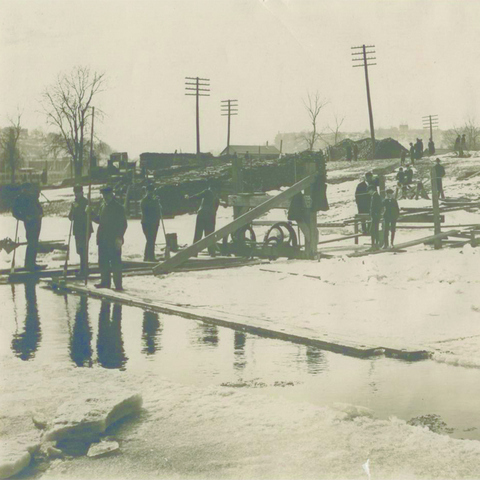 Caroline is said to have followed her ice deliverymen around town in her own horse-drawn buggy to be sure her men were doing their work properly. The many taverns to which they delivered would offer drinks to the drivers in an effort to persuade them to leave a little extra ice. On occasion, upon finding the drivers passed out in the ice wagon, Caroline would drive their team of horses and wagon back to the ice storage warehouse herself with her own horse and buggy in tow. In 1878, long before the Fischer Company owned the Hotel Julien, the Fischer Wheeler & Co. ice business had a contract with the Hotel Julien Dubuque to supply ice to the guesthouse, then under management of W.W. Woodworth. The three-year contract was for “all the ice necessary” for $25 a month or $300 for the entire year. Caroline eventually bought out her partners, invested in downtown and riverfront property, and brought her family into the business that still exists today. Located in view of the Ice Harbor, where the Fischer family business started, Caroline’s Restaurant at the Hotel Julien Dubuque today honors the family matriarch of the Fischer/Pfohl families. The Pfohl connection goes back to 1962, when the hotel was purchased by Louis H. Pfohl. After extensive remodeling, many interesting and historic artifacts were incorporated into the décor, including the stunning stained glass that’s now displayed in Caroline’s Restaurant. The menus at Caroline’s Restaurant are influenced by what’s grown locally and what’s readily available. The talented culinary team at the restaurant also focuses on making dishes as aesthetically pleasing as they are delicious. This attention to detail and commitment to excellence is a fitting tribute Caroline, the great-great-grandmother of the three cousins who today manage the Fischer Companies and the Hotel Julien Dubuque, a landmark of Iowa history. Want more great Iowa food stories, history and recipes? Check out my top-selling “Culinary History of Iowa” book from The History Press, and order your signed copy today.